We’ve returned! Bad Rider has been on a bit of a hiatus through the fall, but getting back into the swing of things was high on my list of plans for 2016. I’ve got some interesting ciders in the fridge, ready and waiting for reviews, though we’ll be cutting back to a once-weekly schedule for beer and cider rather than our previous twice-weekly. Buying another root beer cider could have gone poorly, and in hindsight, if I knew what was good for me I’d have been more hesitant about picking it up. Here we are, though, with Elemental Cider’s “NW Atomic Root Beer” cider, which they’re billing as cider “infused with spices,” and in this case, living in eternal hope paid off: I quite like it! It’s rich in color, a dark amber orange, and the aroma is present and sweet, with classic root beer spices and vanilla. Overall it gives a much more distinct, robust impression of root beer than Sonoma’s Washboard — understandable, since it’s right there in the name and everything. In fact, there’s very little apple to it; the cider seems to be mainly a carrier for the spice/vanilla root beer flavor, with just a bit of apple flavor and sweetness underneath it. In my day I’ve had both good and bad root beer liqueurs (Blackmaker and DeKuyper, respectively), and this cider is more the former than the latter. Clocking in at 6.5% ABV, it’s certainly much more drinkable on its own than either. Elemental doesn’t have a store locator or anything, but if you’re in the Seattle are you can go visit them, or check out Downtown Spirits, which is where I get a lot of my cider. Posted in Cider. 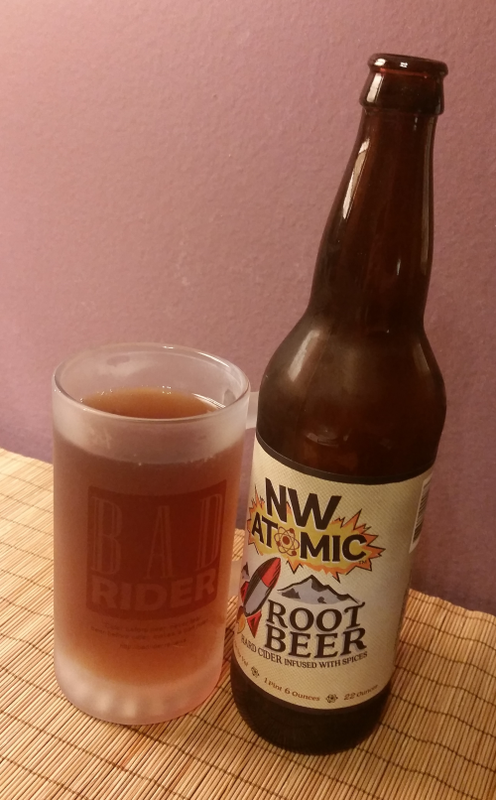 Tagged 650mL, elemental cider, nw atomic root beer.